I recently discovered Lemon Loves Lime, a great label for little girls. It's funky without being too funky and is girly while using loads of other colors besides pink. 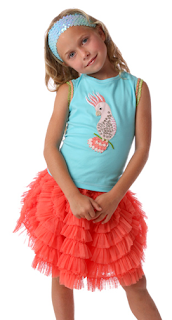 Their new summer line showcases all sorts of tropical and water creatures...and mermaids of course. If you've ever wondered who's responsible for a lot of the cute girl clothes found at retailers like Chasing Fireflies, you now know! Lemon Loves Lime was started by a mother who wanted to express her love for her daughter. She now hopes that the clothing you purchase expresses your love for your little girl...and from the looks of the clothing and accessories offered, each piece will do just that! Visit lemonloveslime.com to see all of the collections and for purchase locations.